“Who is Donna Troy?” There was a time when that melancholy question could make you feel something singular. Not an emotion, exactly. Not curiosity. What? “Who is Donna Troy?” It’s not a question but a mystery. There’s a difference. Reading those words on that cover. A broken wall. Torn posters of a girl’s face. And behind it a man, his gaze hooded. The weak glow of a lamp. The man doesn’t look at us. Only the girl does. Or rather, the poster of the girl. “Who is Donna Troy?” It’s a question you hear, but not aloud. Somehow, it stays on the page. And it doesn’t have an answer, no matter what the story says. The question is a chasm. Just empty space. And you feel it: here. Queasiness. Vertigo. And something else. 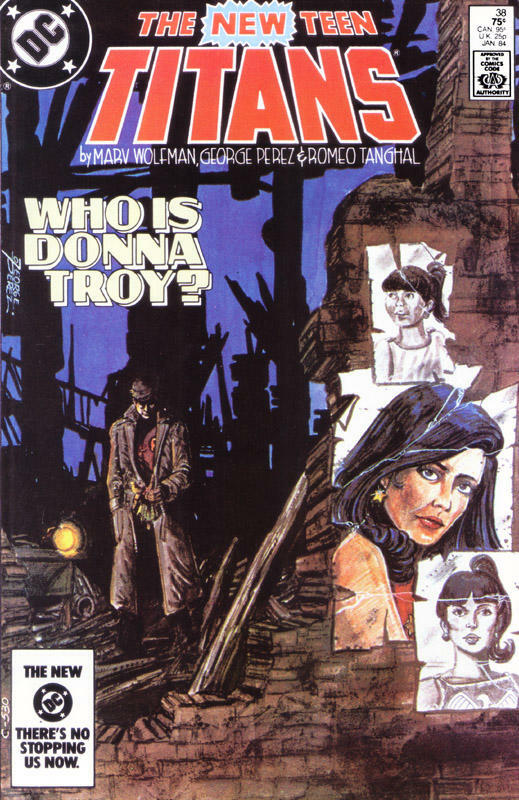 “Who is Donna Troy?” It’s a memory, but not nostalgia. Not even a memory, exactly. A “recollection” of what it feels like to discover something you never knew you lost and can never regain. What was it? “I remember this place,” Donna says. And so do you, even though you’ve never been here. What is this place? What is this ruined wall papered with images of a girl’s face at five, fourteen, twenty? What is this spot in memory marked by a question that is not a question but a precipice. A gap. I believed the Titans themselves needed to be emotionally at odds with each other even while they needed to be friends. To facilitate this I set up two theoretical triangles, one for the male characters, one for the female. For example, put Wonder Girl at the top of the women’s triangle. Donna Troy came from an Amazon race who believed not only in peace, but were also warriors. On one corner of the triangle put Raven, whose interdimensional society were extreme pacifists who would never fight, not even to save their lives. On the other corner put in Starfire, who comes from a pure warrior culture. Three sides of the same coin, so to speak, with enough in common they could be friends, but with enough differences that would keep them at odds. This fundamental conflict, one hoped, would create good stories…. Also take a look at them emotionally: Raven was shy and introverted and found it difficult to confide in others. Starfire was outgoing and pure, lusty emotion. Wonder Girl, once again, was directly in the middle. Neither pacifist nor warrior, neither ascetic nor ecstatic: Donna Troy lays claim to a middle ground, but a strange one that passes through extreme positions rather than steering safely between them. A golden mean that must be understood as negation—neither this nor that—but also as synthesis: a raising up of these contraries by launching through them. This is why Wolfman’s metaphor of triangulation is exactly the right one. Donna does not pass “between” the ethereal Azarathians and the passionate Tamaraneans but subsumes and elevates them, remaining in constant contact with each side of Wolfman’s “golden” triangle and passing through the intensities defined by its multiple points. The singular achievement of Donna’s character, in other words, is to translate superheroic metaphors of desire or its negation—the alien passion of Starfire, the supernatural asceticism of Raven—into immediately human terms. What arrests us about Donna’s character is not her access to alternate “spiritual” dimensions or exotic pleasure planets, but the gloriously rich banality of her emotional life: her desire for domestic happiness with Terry Long (a desire which, in the context of a superhero universe, surely borders on asceticism!) but also the intensity of her fury when she and Nightwing knock heads in the ugly argument of New Teen Titans #19 (second series). The balance that defines Donna’s character is beautifully suggested by the proportion and symmetry of her name. From 1960-1969, Donna was the eighth most popular girl’s name in the United States. The girl-next-door indeed. But the sweet familiarity of “Donna” (Italian for “lady,” and also slang for pretty girl) is offset by the cool remoteness of “Troy”—a name with connotations of an entirely different sort of female beauty. Helen was a girl-next-door too, but a fatal, martial one: the face that launched a thousand ships. If “Donna” is all flesh and freshness, “Troy” has all the warmth of a marble statue. If “Donna” is close enough to touch, “Troy” is remote in time, place, and temperament. 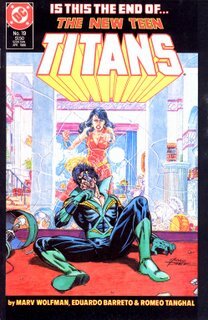 And “Donna Troy,” of course, names a position precisely between these poles of intimacy and inaccessibility, love and war. An American Trojan who is constitutively absent (because she is merely a character), yet almost real. 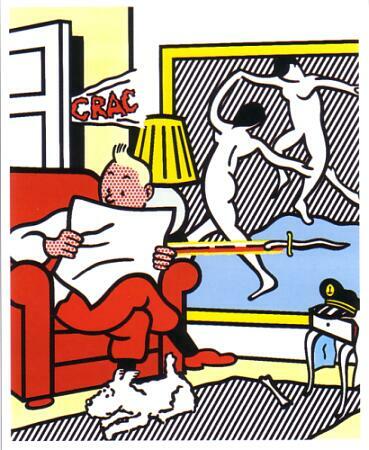 How fitting that she finds a home in that most intimate and tactile of popular literary forms: the comic book which is itself poised between the incongruent categories of word and image, charting a path through both of them that looks rather like a golden mean. And yet, for all that, the symmetry of Donna Troy’s character is perhaps not as perfect as it seems. She may “balance” the extremes suggested by her first and last names, but the gap between them remains vast. Familiarity and difference, present and past, love and war. Are these antinomies really so handily synthesized?